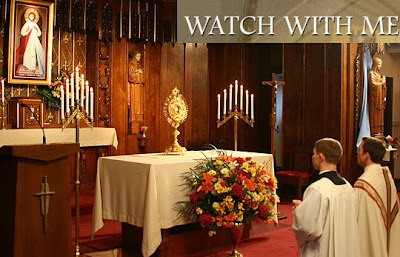 From June 15th-21st, CatholicTV will be showing a documentary on perpetual adoration entitled "Watch With Me". The documentary follows several Eucharistic adorers who include 2 PhD's and a wise 10-year-old. The documentary was made by Karey Nobles who was once a television news anchor. She is now a filmmaker. One night, while praying during her weekly holy hour at St. Joseph- St. Patrick’s Catholic Church in West Utica, NY, Karey felt a calling from God to make a documentary film about adoration. Karey answered God’s call and the result is a documentary entitled, “Watch With Me”. The chapel depicted in the film has been operating for more than 16 years, with over 300 volunteers, taking part in adoration of the Blessed Sacrament 24 hours a day, 7 days a week. Karey spent close to two years following some of the volunteers to learn what motivates them to visit the chapel at all hours of the day and night, and what they gain from the experience. “Watch With Me” tells the story of these volunteers and the role Eucharistic Adoration has played in their lives. The documentary "Watch With Me" will air on CatholicTV during the week of June 15-21st at these times (Eastern): Monday-2PM; Tuesday-10PM; Wednesday-4PM; Thursday-6:30AM; Friday-9PM; Saturday-10:30AM; Sunday-2AM.